Alan Stubbs today conceded Premiership-bound Rangers will go into next month’s Scottish Cup final as favourites to beat his Hibs side after the Ibrox club’s dramatic penalty shoot-out win over Old Firm rivals Celtic. Hibs had clinched their own place in the final just 24 hours previously in similar fashion following a 0-0 draw after extra-time against Dundee United, debutant goalkeeper Conrad Logan emerging the hero as he saved the Tannadice outfit’s first two efforts, paving the way for a return to Hampden. Former Celtic defender Stubbs had admitted that on a personal level it wouldn’t get any better than facing his old club on May 21, a scenario which he had been denied on two previous occasions. But now he’ll relish the opportunity to exact some measure of revenge on Mark Warburton’s players having watched the Glasgow club race away with the Championship title as Hibs’ own season stuttered. The clubs have already met four times this season with Rangers having come out on top three times, and they clash again at Easter Road on Wednesday night in what many will see as a dress rehearsal for the final. Admitting the Hampden showdown promises to be a feisty affair as Rangers seek to add a second cup to their league title, while Hibs will hope to end their 114-year wait for the trophy, Stubbs said: “It would have been feisty if it was Celtic. “Rangers have done great this year. Mark has done what everyone has expected a Rangers team to do. I have to say it has taken the club a year longer than what was expected but I think that tells you how difficult the Championship is. “Mark has done a really good job. I don’t think anyone could have written that they’d get promotion and be in a Scottish Cup final. I think Rangers will rightly be favourites. But on our day, and on a Scottish Cup final day, as we have seen in the past, anything is possible. Before then, however, Hibs face a challenging schedule as they attempt to overhaul Falkirk and take second place in the Championship so ensuring they have two fewer play-off games to face, eight games this month and possibly as many again in May. 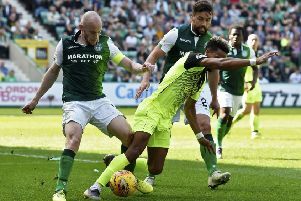 And the week of the final itself could prove pivotal should Hibs get as far as facing the Premiership’s second bottom club, those play-off games scheduled to take place either side of the showpiece match. He said: “We have a lot of football to be played before we get to the final. We know we are in the play–offs, we need to try and finalise now where we want to finish. It won’t be easy, we have a lot of games. When you look at potentially the week we could have, it is quite exciting. “Some of the players are going into every game this season when you are expected to win, mentally it can be quite demanding. That is why I have to take my hat off to the likes of Rangers and Celtic this season. There has been huge expectation on them to win every game.